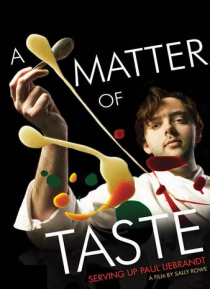 A Matter of Taste takes an intimate look inside the world of an immensely talented and driven young chef, Paul Liebrandt. At 24, he was awarded three stars by the New York Times for unforgettable and hyper-modern dishes such as "eel, violets and chocolate," "espuma of calf brains and foie gras," and "beer and truffle soup. He soon became a chef critics loved or loved to hate.